The number of blockchain jobs posted in the U.S. this year has seen a dramatic increase, according to data provided to CoinDesk from one of the largest jobs sites. The just-published statistics from Indeed.com indicate that, since last December, that number has increased by 207 percent. Even more dramatically, the number of blockchain jobs has increased 631 percent since November 2015. Showing how hot cryptocurrency has become this year after being generally overshadowed by blockchain in 2016, 15 out of the 18 most popular industry jobs specifically mentioned “cryptocurrency” in the description. Moreover, when seen as a percentage of the site’s total number of job postings, the blockchain industry overall increased from only a few jobs per million to roughly 30 jobs per million, showing a slight increase relative to the overall available positions on the site. While many industry observers likely didn’t need the numbers to know the blockchain industry has grown massively over the course of the last year, the quantification is interesting, especially as it relates to the divergence in the number of jobs searched compared to the number of jobs posted. At the beginning of this year, the number of jobs searched neared parity with number of jobs posted, at about 20 searches each per million, according to the chart below, also provided by Indeed. 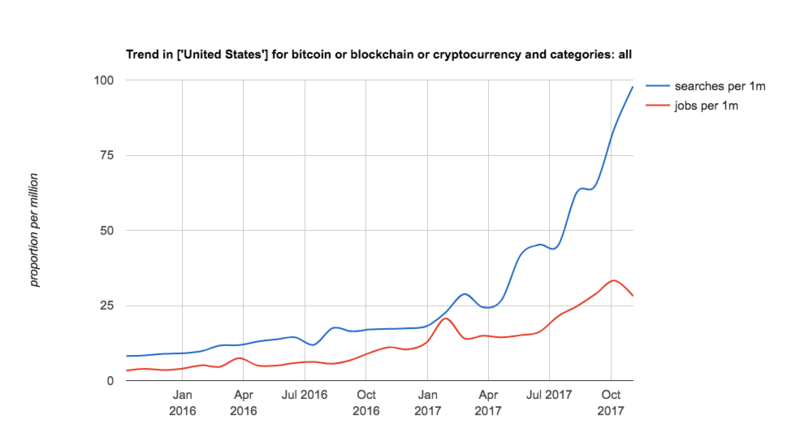 Then, over the course of this year, the frequency of blockchain jobs searched increased by five times to almost 100 blockchain jobs searches per million. This combination of explosive blockchain jobs growth and the interest of jobs seekers has created a tumultuous environment, where the leading employers are duking it out over top-notch talent. While nearly all the jobs on Indeed.com were technical in nature, not all employers are after developers or engineers. This year also marked the birth of the Crypto Jobs List website, dedicated exclusively to crypto industry jobs. Launching in September with the promise to not scrape job postings from other sites, and instead only to publish original opportunities, the site has discovered a niche in the non-technical side of the industry. With an average of two job postings per day, the site has listed 90 blockchain jobs so far, with about 20 more currently being “curated” for possible inclusion. Among those that have been posted are positions for writers, traders, marketers and lawyers. As an example of this diversity, one of the largest industry employers, Deloitte, currently employs about 800 people across its various blockchain efforts, but only 400 of those are either blockchain developers or architects, according to numbers provided to CoinDesk. The other half of those jobs include positions such as business analysts, strategy and technology consultants, and tax and accounting experts. An estimated 75 percent of all blockchain jobs result from cross-training existing employees – an increasingly popular trend, according to Eric Piscini, a Deloitte principal who oversees much of the firm’s blockchain work. “Every morning when I wake up the first thing I think about is, where can I find more people to join the team?” he said. In addition to cross-training employees, Deloitte hires many of its staff from educational institutions and is one of the largest posters of jobs in the provided Indeed.com data. But it’s not just the types of opportunities that differ greatly from job site to job site. It’s also the types of employers. On Crypto Jobs List, the top three biggest blockchain employers are interoperable smart contracts startup Wanchain, ethereum client software startup Parity Technologies and asset management startup Cindicator. On the flip side, Indeed.com appears more attractive to legacy firms, with industry mainstays like Deloitte and JPMorgan, as well as interesting newbies including eBay, ESPN and Uber using the premium Indeed Prime service to actively seek out candidates. CoinDesk also reached out to several other large blockchain companies to get an idea of how employment numbers have changed. Distributed ledger consortium R3, which earlier this year raised $107 million in venture capital, has grown its staff from 30 in early 2016, to 90 at the beginning of 2017, and as high as 150 today, according to the consortium’s head of global talent, Simon Clarke. Clarke said R3 has had to become more competitive with its compensation packages, while focusing on creating a culture that encourages employees to stick around. Computing giant IBM said that other large enterprises aren’t the biggest threat in attracting talent. 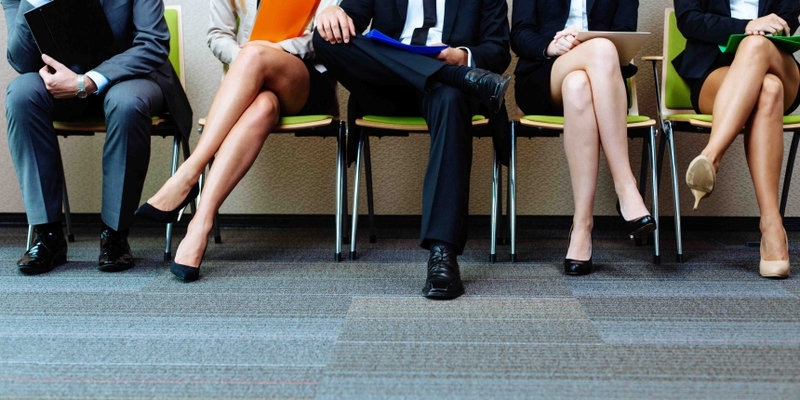 According to the firm’s vice president of people and culture, Mike Schade, it’s rather the blockchain startups that are most attractive to job seekers. Since the beginning of the year, IBM has grown the number of blockchain-focused employees it has from 400 to 1,500, primarily by giving those employees access to its biggest clients (whereas startups generally offer equity in the company). Yet, if that doesn’t work, Schade said the tech giant works to keep friendly relations with even former blockchain employees, in case the startup life doesn’t work out. “We keep in touch with them closely,” he told CoinDesk. Beyond just changing the relationship these companies keep with former employees, blockchain technology is also changing the nature of employment itself, according to Andrew Keys, an early employee of ethereum startup incubator ConsenSys. Formerly the head of global business development for the firm, Keys is himself as an example of the evolving arrangements that are helping change what it means to be an employee. Keys is now the co-founder of ConsenSys Capital, which is just one of more than 25 so-called “spokes” of ConsenSys as a larger company. Each spoke has its own founder, who interacts with the corporate hub in his or her own way. But along with their job titles, Keys and other employees identify as “members” of ConsenSys, an allusion to their varying vested interests in the company’s success. The company, which grew from about 100 employees in January to about 470 today, offers a spectrum of compensation arrangements, including varying degrees of equity, salary, token distribution arrangements and other affiliations. “We’re blurring the lines of what employer-employee relationships are,” Keys told CoinDesk. In the end, though, the total number of blockchain jobs in the economy will likely be more difficult to calculate than any other profession, as will their impact on other jobs. While jobs numbers are always an estimate, blockchain roles in particular will likely always be tough to quantify due to the pseudonymous or anonymous nature of many in the industry. That’s not the only reason why the impact of blockchain on the jobs market could prove difficult to calculate, though. The often touted “increased efficiency” achieved by a shared, distributed ledger has increasingly become a widely used euphemism for cutting jobs. Earlier this year, Digital Asset Holdings founder Blythe Masters warned that there was no guarantee blockchain would be a net win for the jobs industry. Echoing that sentiment is Mizuho Bank senior digital strategist working with blockchain, Ikuma Ueno. Following an address Ueno gave at banking conference Sibos earlier this year, he argued in interview with CoinDesk that employers might eventually have a responsibility to retrain the employees that blockchain makes irrelevant – if they can.